SOLAR STATION is an autonomous and modern building integrating electrical solar production and storage. It has been sized to offer safe, affordable and of high quality to users. OLAR STATION works without having to be connected to public grid. It stills transforms, stores and manages the energy produces during day-time to supply electrical self sufficiency. This solution has been designed to withstand hot and humid climate either off-grid or into harsh urban environment. It’s endowed with double skins insulation to offer best thermal and acoustic comfort. SOLAR STATION appears as a focal point to community life, for social and economical activities. It’s a next generation autonomous equipment. 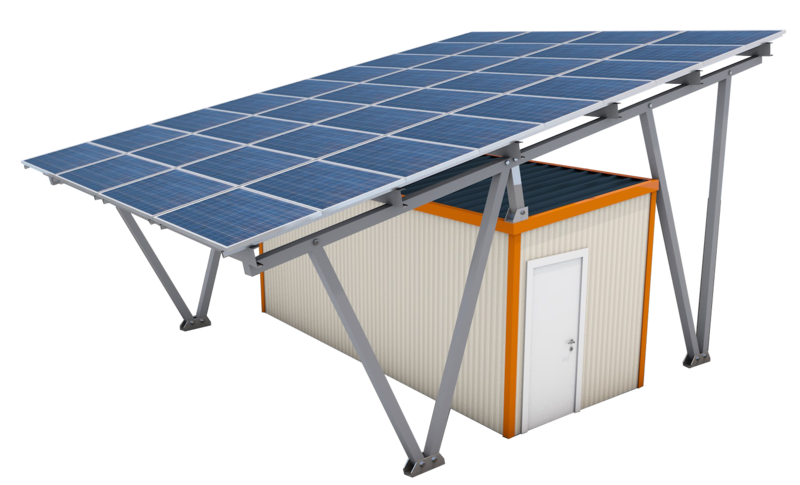 SOLAR STATION is entirely produced in our factory; its frame is particularly robust, safe, modular and adaptive according to system requirement specifications and complies with European quality standards. 40mm injected polyurethane sandwich type walls, thermal acoustical insulation. Alu minum door, PVC windows,paneled, stationary fixed closing. Galvanized steel frame, PVC gutter, fiber glass insulation, covering. Photovoltaic Integration: galvanized steel frame. Solar Panels: 270Wp, aluminum frame. Solar Charge Controller, Inverter-Charger, Monitoring+Metering, Synchronisation. 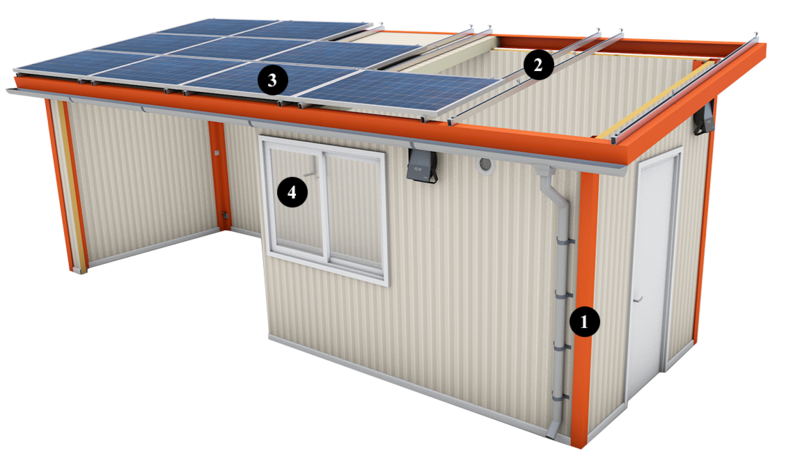 Solar Station portfolio represents 4 different spatial configurations. Select the type of building and select the ideal electrical ADIBOX autonomous configuration. Starting at 5m². Solar Station covers different requirements depending on spatial and electrical needs. A Store Station starting at 9m². Best for local business activities in extra-urban or isolated rural areas. Home Station starting at 14m². Best for Transitional settlements, base camp or business office. Starting at 18m². Best and adaptable to centralize site layout for living, working activities and energy production.